Using a staking method (or money management strategy) is a crucial component of making a consistent profit from betting. The Kelly Criterion is often cited as the best option to use for various reasons, but how does it work in practice? How risky is the Kelly Criterion? Read on to find out. Much has been made of the Kelly Criterion as the most efficient money management strategy to maximise a winning bettor’s rate of bankroll growth. Pinnacle’s Betting Resources has produced several articlesreviewing what the Kelly Criterion does, how it works, and its advantages and disadvantages. In this article, I offer a simple risk assessment of the staking method. Pinnacle author and mathematician at the University of Malta Dominic Cortis describes the Kelly Criterion as a means of calculating the proportion of your own betting funds to bet on an outcome whose odds are higher than expected so that your own funds grow exponentially. The edge is simply the advantage you hold (or think you hold) over the actual bookmaker’s betting odds. For example, if you think the fair odds of an outcome are 2.00 (a 50% probability of success), but the bookmaker offers you 2.10, you can calculate your edge as 2.10/2.00 = 1.05. An “edge” is just another way of describing expected value. The odds in the equation above should be quoted in decimal notation. Hence, for this example, your Kelly stake percentage would be 0.05/1.10 = 0.0455 or 4.55%. Kelly is an example of a proportional staking method where stake sizes are proportional to the size of your existing bankroll, and will therefore rise or fall as your bankroll grows or shrinks, in contrast to level staking where stakes are fixed to a predetermined size. What is special about Kelly is that it also takes into account the size of you perceived advantage and the length of the betting odds. The greater your advantage and/or the shorter the betting odds, the larger the stake you will risk. Evidently there are problems associated with calculating Kelly stake percentages when betting on more than one outcome or match simultaneously; Pinnacle has published an article dealing with those. For the remainder of this piece, however, I will only be considering the simplified form of Kelly applicable to one bet at a time. How risky is the Kelly Criterion? As a proportional money management strategy it should be fairly self-evident that you can’t technically go bust using Kelly. The more you lose, the smaller your stakes will become, but theoretically you would never reach zero. Unlike casino games which are based on known mathematical algorithms, ‘knowing’ the true probability of a complex system like a soccer match is effectively impossible. In practical terms however, there will obviously reach a limit where the losses you incur would be considered unacceptable. Thus, it is perhaps more appropriate to consider the variance in the size of your bankroll and whether your risk preferences will be robust enough to cope with those. Guest author for Pinnacle and stock trader Joe Peta has previously arguedthat the problem with Kelly is that “no matter what you calculate your expected return to be, your variance will be ridiculously… and… uninvestably high.” He asks us to consider a theoretical bettor winning 52% of their bets with odds of 2.00. Kelly implies a stake percentage of 4%. Assuming a series of 250 bets, Peta claims there’s greater than a 10% chance your bankroll will be down by at least 40% by the end. Is he correct? Pretty close it would seem. Using these parameters in a 10,000-run Monte Carlo simulation, 14% of the final bankrolls finished with less than 60% of the initial fund. This compares to just 9% for a level staking strategy with each of the 250 stakes fixed at four units (given a 100-unit starting bankroll). The table below illustrates the broader comparison of Kelly versus fixed staking. As I’ve argued in a previous article, whilst proportionally staking is better suited to optimising profitability (in this simulation average closing bankrolls for Kelly and fixed staking were 149 and 140 units respectively), it takes longer to recover from losing periods. 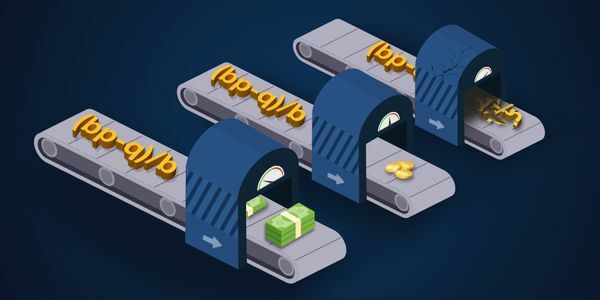 The greater proportion of closing bankrolls showing losses is simply a consequence of the greater bankroll variance that the proportional staking introduces. Nearly four in ten of these simulations finished with losses for Kelly staking, compared to just one in four for fixed staking. How do the risks change if we hold a greater advantage? I re-ran the simulation for a 54% win probability for every even-money wager, with a Kelly stake of 8%. Very few bettors will be able to achieve those figures over the long term. It goes without saying that if you think 52% of your even-money bets will win but you end up winning only 49% of them, you are going to lose money over the long term. Understandably, with double the edge or expected value for each wager, the expected profitability is now considerably better for Kelly compared to fixed staking (average closing bankrolls of 494 and 260 respectively). Unfortunately, this is still at the expense of a considerably greater variance in performance. The average or expected finishing bankroll is higher because it is skewed by a small number of very large bankrolls. However, there are far more mediocre and losing bankrolls compared to the fixed stakes strategy, with a median finishing bankroll of just 223. The probability of losing 40% of your wealth after 250 even-money bets with an 8% advantage following a Kelly strategy is still 14%. No doubt, Joe Peta would argue that no self-respecting financial investor showing an 8% return on investment would accept such a risk. Do we really know our edge? These simulations assume that we know exactly what the probability is of winning, and hence exactly what advantage we hold over the bookmaker’s odds. As Joe Peta reminds us, however, modelling sports betting outcomes is not blackjack card counting. Unlike casino games which are based on known mathematical algorithms, ‘knowing’ the true probability of a complex system like a soccer match is effectively impossible. The implications for the success of the Kelly strategy of not knowing precisely your advantage over the bookmaker’s odds were discussed recently on my twitter feed. I resolved to find out just what the impact would be. It’s only necessary to know your average advantage accurately when determining how much to bet with Kelly and managing its risks. It goes without saying that if you think 52% of your even-money bets will win but you end up winning only 49% of them, you are going to lose money over the long term, no matter what staking method you follow. Of more interest here is whether not knowing precisely the advantage held for every bet will increase the variances and risks associated with Kelly. A long-term betting history will give you a clue as to what your average advantage might be. Return €1,050 from 1,000 €1 bets and you might reasonably assume that you hold a 5% advantage on average. Another way to estimate an advantage is to compare the prices you bet to the closing market prices. If you bet a price of 2.10 and Pinnacle closes at 2.00, my data analysis implies that you would hold a 5% advantage (discounting the betting margin). But such analysis was based on aggregating large numbers of soccer matches. Whilst an average advantage might be implied, we cannot use this to assume that it is the same for every bet. With so much uncertainty influencing the outcome of sporting events it is quite reasonable to expect that it won’t be. I ran another Monte Carlo simulation for 250 even-money bets. This time, however, instead of fixing the win probability at 52% for each one, it was varied according to a normal distribution of win probabilities. Whilst the average was 52%, the specific values varied around this. Some were higher, and some were lower. I applied a standard deviation of 5% meaning that about two-thirds of the values fell between 47% and 57% and 95% of the values fell between 42% and 62%. In fact about a third of them fell below 50% and hence held negative expected value. The results were quite a surprise. Despite a third of the bets holding negative expected value, the associated risks of the Kelly strategy were effectively unchanged. Essentially this implies that so long as you have an accurate idea of you overall advantage, it’s not important to know it precisely on a bet-by-bet basis. Kelly 1 – Edge known exactly for every bet. Kelly 2 – Average edge known but specific edge for each bet unknown. In an attempt to test the robustness of this conclusion I ran a further simulation where the number of bets with negative expected value was dramatically increased. Two hundred and thirty (or 92%) of the 250 wagers were assigned a win probability of 49%, effectively equivalent to Pinnacle’s betting margin for popular two- or three-way betting market. The remaining 20 wagers were assigned a win probability of 86.5% to ensure that the average for the 250 wagers remained at 52%. The results were exactly the same. Of course in reality it’s very unlikely that a bettor unable to find any value in 92% of their wagers will somehow find huge profitable expectation in the remaining 8%, but this exercise nonetheless further illustrates the point previously made: it’s only necessary to know your average advantage accurately when determining how much to bet with Kelly and managing its risks. For most bettors finding any sort of edge at all is a much tougher problem to crack. It’s all too easy to be fooled by luck and illusions of causality that encourage the bettor to believe they are better than they really are. Win only 49% of your even-money bets and a 4% Kelly strategy unsurprisingly fails far more often (with a three in four probability of loss-making after 250 even-money bets, compared to three in five for fixed staking).